Three devices made the Christmas lists of many in 2012, but which was the best out of the Apple iPhone 5, the Samsung Galaxy S3 and the LG Nexus 4? May of 2012 brought us the Samsung Galaxy S3, and it went on to become the best seller of 2012. This was followed up by the Apple iPhone 5 in September and then the LG Nexus 4 in November. The LG Nexus 4 came with the 1.5GHz quad core processor from Qualcomm while the Apple iPhone 5 had the A6 processor at 1.2GHz. Internationally the Samsung Galaxy S3 has a quad-core processor from Exynos and in the US this is a dual core. On paper, the Apple iPhone 5 comes with the slowest processor of three devices; however, it does happen to be twice the speed of the Apple iPhone 4S. The LG Nexus 4 should have the best combination of them all with the 2GB of RAM and its quad-core processors. The Samsung Galaxy S3 comes with four cores but 1GB of RAM, or two cores and 2GB of RAM. As the LG Nexus 4 covers both, it has to be a winner. The LG Nexus 4 comes with Jelly Bean 4.2 while the Samsung Galaxy S3 has Android 4.1. The Apple iPhone 5 has the lasts iOS 6, and if it is a streamlined OS you want, then you will go for this. However should you want to be able to customise your device then one of the two Android handsets is the better option. Both the Samsung Galaxy S3 and the LG Nexus 4 had Android; however, it is the LG Nexus 4 that will get updates faster. In this respect, we have to call it a draw. You can get your hands on the LG Nexus in either 8GB or 16GB models, but neither of the devices comes with support for SD card. The Samsung Galaxy S3 is in 16GB, 32GB or 64GB versions, and they all support SD card up to 64GB. The Apple iPhone 5 offers the same internal storage, but no support for SD card. 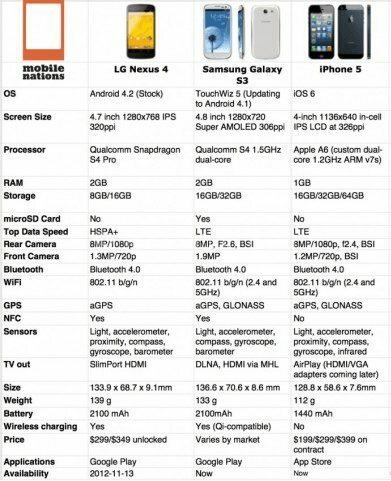 The Samsung Galaxy S3 is the clear winner here. The LG Nexus 4 comes with a display of True HD IPS Plus at 4.7 inches, with the resolution being 1280 x 768, offering 318ppi. The Samsung Galaxy S3 comes with a Super AMOLED screen of 1280 x 720, which has 306ppi, while the Apple iPhone 5 has the smallest display at 4 inches, with 1136 x 640 resolution and 306ppi. All of the screens are great and, of course, the best is a matter of personal choice. The IPS display usually provides colours that are more realistic, while AMOLED can be oversaturated, and some say, hyper-realistic. Thanks to the LG Nexus 4 having the large IPS display, it wins. You should be able to get up to 15 hours talking with the LG Nexus 4 as it comes with a battery of 2100mAh. The Samsung Galaxy S3 and the Apple iPhone 5 both offer up to 8 hours. In tests by AnandTech the Apple iPhone 5 lasted the longest, with the Samsung Galaxy S3 in 2nd place and last was the LG Nexus 4. In regards to weight and size the LG Nexus 4 is 133.9mmx68.7mmx9.1mm and 129 grams, the Samsung Galaxy S3 is 136.6×70.6mmx8.6mm and 133 grams, while the Apple iPhone is a tiny 112 grams and 123.8mmx58.6×7.6mm. When it comes down to looks, it is the Apple iPhone 5 that wins, however the LG Nexus 4 is not far behind. If you can get your hands on the device you should be able to pick it up for around $299 if you want 8GB. If you want the larger 16GB you can expect to pay $349, if you purchase the handset at the Google Play Store. If you want the Samsung Galaxy S3 expect to pay around $550 without a contract. Off contract, the Apple iPhone 5 will cost you around $650. With its low price tag, the LG Nexus 4 has to be a winner. If you want support for NFC, it will have to be the Samsung Galaxy S3 or the LG Nexus 4. If it’s LTE you want then, it will be between the Samsung Galaxy and the Apple iPhone 5. If you want both options then you will have to go with the Samsung Galaxy S3. The LG Nexus 4 has a camera on the back of 8 megapixel, which has 1080p videos, autofocus and LED flash, while the front camera is 1.3 megapixel. The Samsung Galaxy S3 offers an eight megapixel back camera, complete with autofocus and LED flash, with a 1.2 megapixel front camera. The Apple iPhone 5 also boasts an 8 megapixel camera, along with 1.2 megapixel cameras on the front. Each of the device’s cameras has their own pluses. You can record video and take photos with the Samsung Galaxy S3 at the same time, and the LG Nexus 4 offers PhotoSphere, while the Apple iPhone 5 wins as it has the BSI sensor. The Apple iPhone 5 is the easiest of the devices to use. The LG Nexus 4 is the cheapest, and it also offers the best value for your money. The Samsung Galaxy S3 is a solid all-round handset that comes packed with features, and it is has a medium price tag.